Professor Richard Fortey looks at the different survival techniques of the rock pool animals as they experience and survive long periods of time without any food. Over time adaptations have been made to allow them to survive the ‘in between' zone. Changes in moisture and salinity affect the tissue of many different plants and animals. In low tide there is an increased competition for resources and maintaining a good position will increase the chances of survival. Sea anemones have adapted allowing them to become good hunters. 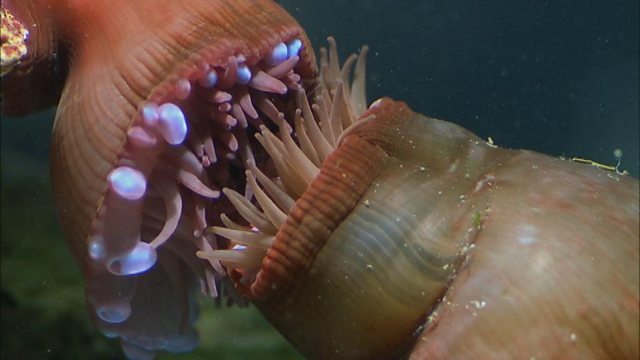 Dr. Mark Griffer introduces the feeding techniques of the assumed to be motionless sea anemones. Feeding tentacles move slowly to trap food and then move it towards the oral disc/mouth. Specialised fighting tentacles are used against others of the same species resulting in the loser moving away to settle elsewhere.